Magnetic media stores data by assigning a magnetic charge to metal. This metal is then processed by a read head, which converts the charges into ones and zeros. Historically, magnetic media has been very popular for storing programs, data, and making backups. It looks set to continue in this role for some time. However, solid state technology is starting to be used more and more, storing programs and data on new devices such as mobile phones and cameras. Platter - Metallic disks where one or both sides of the platter are magnetised, allowing data to be stored. The platter spins continuously, thousands of times a second, around a spindle while in use. There may be several platters, with data stored across them. The disk is divided into tracks and sectors with data represented by magnetising spots on the disk. Actuator Arm - used to move the read heads in and out of the disk so that data can be read and written to particular locations. They allow you to access data in a random fashion, so you don't need to read your way through the entire disk to fetch a particular bit of information, you can jump right there. Seek time is very low. Increasingly obsolete, the tape has been a medium to deliver software and back up data since the early days of computing. Nowadays they are used mostly for corporate backing up and archiving of data. Tapes are sequential data stores, meaning that if you had information stored at the end of the tape you would have to wind your way through the entirety of the tape before you could read it. There is no random access like with a hard disk! Tapes can be several terabytes in size and reading and writing can be very fast as long as you read or write continuous sections of the tape at once. Optical media works by creating a disc with a pitted metallic surface. There are several different types of disk out there ranging from 650 MB to 128 GB, with the pits and lands getting closer together for higher volume disks. The principle behind how each of them works is the same. pitted surface visible on the surface of a CD. Massively zoomed in! A CD-ROM is a metal disc embedded into a plastic protective housing. Each disc has to be 'mastered'; this is the process of creating the CD and placing the data on it. CDs are WORM (Write Once, Read Many) media; this refers to the fact that once they have been mastered, there is no way to change the data on them. Data degrades with time, discs from 20 years ago might not work! The CD-R is made of a reflective metal disk with a layer of (usually green, opaque) dye on top. A single track runs in a spiral pattern from the centre of the disc to the outside. The CD-RW is made of a reflective metal disk with a layer of a special ('phase change') metal on top. A high-powered laser is shone onto the CD-RW. Depending on whether this is very high powered or heats at a slightly lower temperature, the top layer of metal cools differently. These will result in different amounts of reflectivity, which represent the 1s and 0s. Work in much the same way as a Flash drive and can often be converted into Flash Drives. 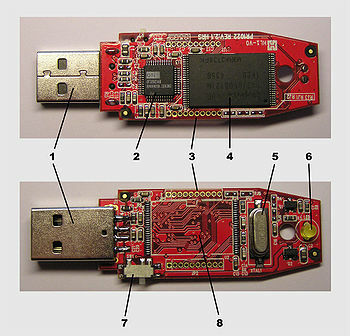 They have different connectors and are generally smaller than USB Flash drives allowing for them to be used in cameras, mobile phones and game consoles. A company needs to backup some HD movie files for 4 years. NOTE: nothing that is ROM! Why do some people reckon that Blu-Ray will be the last optical disk format? NOTE: Rs wouldn't be suitable as you would have to keep throwing them away! This page was last edited on 19 July 2018, at 09:45.